Inside each of us resides a warrior who knows their worth and, equally, a critic who knows how to diminish that sense of worth. Our critic was formed very early in our lives, specifically from early painful life experiences. She impacts our behaviors, relationships and decisions; and shapes our thinking and direction we take in life. As we focus to and nurture the warrior, her voice becomes more prominent, putting our critic more at a distance. But when we give into the critic, the warrior begins to disappear. And the more we feed her, the further the warrior gets from our view. "You look ridiculous in those jeans." "You should give up while you still can." If, like a lot of us, you tend to be over critical about yourself, you will put her on full blast and believe a lot of what she has to say. Know that you are not alone. When that voice shows up there are a few things you can do. And a good starting point is by getting to know a few things about her first. When we humanize our critic we give her an identity. We want to give her a name because doing so separates her from us. If she is a part of your life, you may as well call her something, right? Take some time and play with this one until you find a name that resonates. After you've given her a title, decide on a gender. For some, it could even be a male. Is this part of you a child, adolescent or early adult? All these things help to separate her voice from yours. Her words from yours. The process of giving her an identity her makes engaging with her seem more tangible because she is no longer 'invisible' but brought to the foreground. Think of any store incident where a parent has said No to their child wanting something. If you've ever seen that scenario, you know exactly how that child probably responds. Your inner critic wants you to see her. So, the first thing you want to do is notice. Acknowledge her existence, because the more you pretend you don't see her, the bigger she's going to make herself to get your attention. That can turn up in the form of louder words with heavier weight. Yes, she throws tantrums too. Just like the child in the store who is about to burst out into tear-filled fireworks, your inner critic is going nowhere until you say, "Ah, there you are. I see you." She is an attention seeker and wants your attention, and she will kick and scream until you acknowledge her existence. Believe it or not, your inner critic is likely to show up during different themes in your life, so it is super beneficial to identify her traits and timelines. That starts with paying attention to when she shows up. Maybe you're going on a date and your confidence takes a massive blow. Or perhaps you're about to embark on a really big step in your life and suddenly you feel hopeless and derailed. Chances are that's her favorite time to show up. So, pay attention to those themes; whether it's a breakthrough you're really close to, or you've just found the guts to do something new. She's going to come in at a certain - and if you look at it closely - a predictable time. And she's going to want air time. It is also beneficial to pay attention to long she stays and when she leaves. Your inner critic will most likely always come when something exciting or life changing is about to happen for you. She is that predictable. And knowing this can prepare you. Okay, now what? 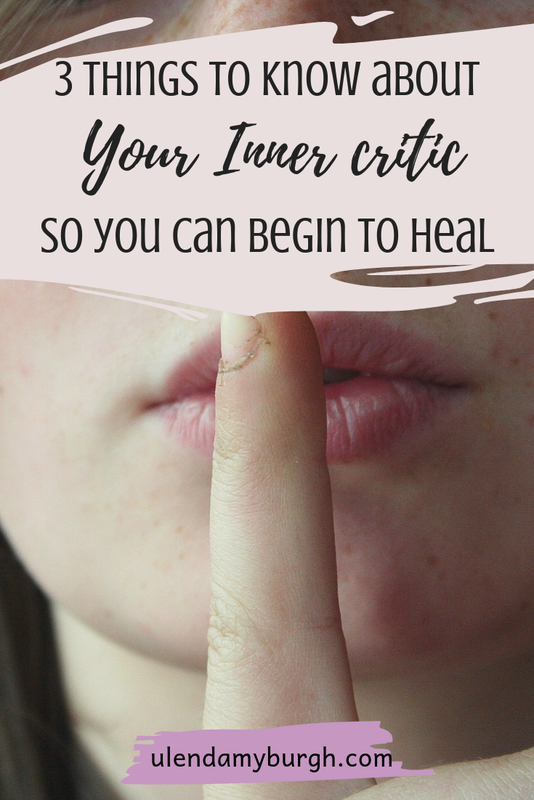 Since we know her tactics, below I'll share with you how to engage with your inner critic so you don't have to feel defeated each time she come in. It's highly beneficial to know that your inner critic was formed from a fear based part of you, which means she's not purposefully out to derail you. She's just an afraid part of you who learned to operate this way. I strongly believe in self kindness, so the first step is an important one. The next time your inner critic comes around, take a few breaths and ask yourself:"Would I, as the adult I've become, tell my 10 year old version that he or she is not smart enough? Not able to succeed? That's she's fat, ugly, unloving, boring?" Probably not, right? So, if you would never tell your 10 year old loving self that, you shouldn't accept it from anyone else. You are the driver of your vehicle, and therefore, where you decide to go is up to you, not her. It's time to establish some boundaries with her and with yourself, that you are in charge and that if you listen it's to learn, not to be bullied. Next time she comes around, engage with her in way that allows you to have a dialogue. If someone were to come to you to solve an issue, you would not let them do all the talking and just walk away. You would have a back and forth. It is entirely okay to have a conversation with someone without giving in to them. So, when she comes in, notice what words she's using to converse with you. Write it down if you can because this habit will get you learning important things about yourself that may benefit you later on. Remind yourself that are in charge and go in with a curious mind, and without judgment. Because, remember: there's a reason she exists and we want to eradicate that negative self talk. For example, when she tells you why you can't, you can ask a more powerful question. "Why do you think I can't?" And instead of being defensive, be open. Let her tell you why. If she says it's because you have failed before, remind her that it doesn't mean you'll fail again and remind her of all the fails you've turned around. As you go back and forth like this you not only begin to see what she's really afraid of, but you learn to quieten her as you begin to discover your own hidden fears. As your answers start getting reflected back to you, continue to write them down. Keep note of them, because they're telling you what areas you need to check into in your life experiences. And once you know, you can take strides in changing that which is not serving you. As that conversation goes and you set your stance, your warrior will grow and the inner critic may not completely go away, but she will have less of an effect on you and her voice may not be as loud or frequent. In as much as we give our critic head space, we want to give our warrior heart space. When we are well established in our strengths, we can find a way to maintain a relationship with our lifelong critics. As much as we give her head space, it's more important that we shift the focus on feeding our warrior. Our warrior lives from a place of Yes and knows the importance of self care. Maintaining this strong inner voice is going to look anything like nurturing who are you, establishing your preferences and style, doing more of what makes you happy, authentic, grow and succeed. As you begin to nurture these qualities in you and dig down deep, you will begin to feel more structured in your foundation.